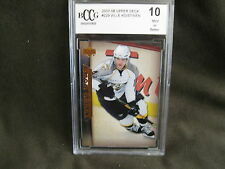 PREMIERE SP UPPER DECK YOUNG GUNS ROOKIE CARD GRADED BGS BCCG10 BY BECKETT GRADING SERVICE of VILLE KOISTINEN CARD FROM 2007-2008 UPPER DECK HOCKEY. VILLE KOISTINEN ROOKIE (BUFFALO SABRES-D) SP 2007-2008 UPPER DECK YOUNG GUNS ROOKIE PREMIERE CARD#229 GRADED BGS BCCG10 BY BECKETT GRADING SERVICE (0002057405)! 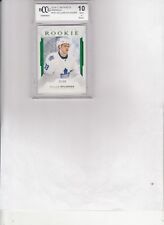 PREMIERE SP UPPER DECK YOUNG GUNS ROOKIE CARD GRADED BGS BCCG10 BY BECKETT GRADING SERVICE of PATRICK EAVES ROOKIE CARD FROM 2005-2006 UPPER DECK HOCKEY. PATRICK EAVES ROOKIE (OTTAWA SENATORS-RW) SP 2005-2006 UPPER DECK YOUNG GUNS ROOKIE PREMIERE CARD#458 GRADED BGS BCCG10 BY BECKETT GRADING SERVICE (0001767160)! 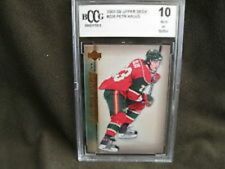 PREMIERE SP UPPER DECK YOUNG GUNS ROOKIE CARD GRADED BGS BCCG10 BY BECKETT GRADING SERVICE of PETR KALUS CARD FROM 2007-2008 UPPER DECK HOCKEY. PETR KALUS ROOKIE (BOSTON BRUINS-RW) SP 2007-2008 UPPER DECK YOUNG GUNS ROOKIE PREMIERE CARD#226 GRADED BGS BCCG10 BY BECKETT GRADING SERVICE (0002117813)! BCG 8.5 NM-MT . ALEXANDER OVECHKIN ROOKIE AUTO/JERSEY 179/499. Front of the card has a piece of an Authentic Jersey worn by ALEXANDER OVECHKIN in a NHL PHOTO SHOOT. 2005-06 SPx - #190. This Ovechkin rookie card has a special foil stamp on the front as you can see - from the 2014 Sportsfest in Chicago. You could be the lucky owner of one of these rare Ovechkin rookie cards! I am partnering with them to build a deep bore water well in a 3rd world country. Card #106. The card is serially numbered 508/999. The card is in Mint condition and has been graded a perfect 10 Mint or Better by Beckett BCCG. This Ovechkin rookie card has a special foil stamp on the front as you can see - from the 2014 Fall Expo. You could be the lucky owner of one of these rare Ovechkin rookie cards! I am partnering with them to build a deep bore water well in a 3rd world country. PREMIERE SP UPPER DECK YOUNG GUNS ROOKIE CARD GRADED BGS BCCG10 BY BECKETT GRADING SERVICE of R.J. UMBERGER ROOKIE CARD FROM 2005-2006 UPPER DECK HOCKEY. 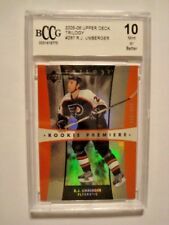 R.J. UMBERGER ROOKIE (PHILADELPHIA FLYERS-C) SP 2005-2006 UPPER DECK YOUNG GUNS ROOKIE PREMIERE CARD#449 GRADED BGS BCCG10 BY BECKETT GRADING SERVICE (0002032385)! CHECK SCAN THIS RARE VIVID CARD HAS RAZOR CORNERS,IS WELL CENTERED,& CLEAN FRONT & BACK,OUTSTANDING !